Exposing blue zircon to long-wave ultraviolet (LWUV) radiation introduces a brown coloration, resulting in a somewhat unattractive, much less valuable gemstone. Common sources of accidental long-wave radiation that can affect mounted faceted blue zircons are tanning beds and UV lights used to apply acrylic fingernails. To determine if the LWUV-induced brown color in zircon is completely and easily reversible, quantitative UV-visible spectroscopy was used to measure the difference in absorption before and after LWUV exposure. 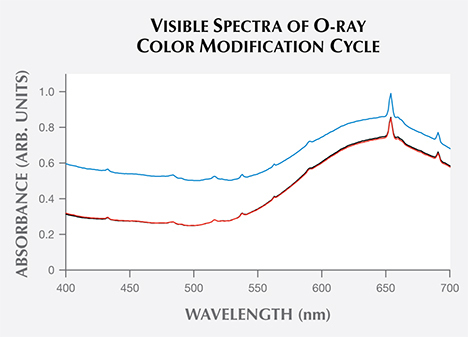 This study explored the nature of the UV-induced color-causing defect to establish whether subsequent exposure to visible light would completely restore the blue color. Spectroscopic examination showed that blue color in zircon is due to a broad absorption band in the ordinary ray, starting at 500 nm and centered at approximately 650 nm. 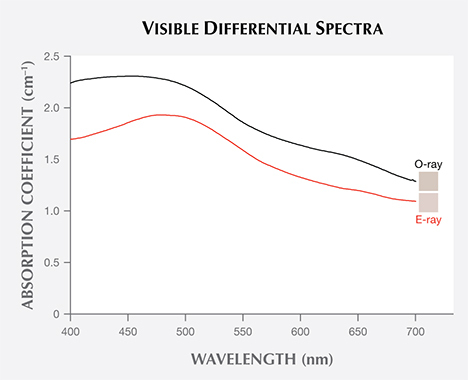 LWUV exposure induced absorption features, including a broad band centered at 485 nm that was responsible for the brown color. Zirconium silicate (ZrSiO4), better known as zircon, is prized for its brilliance, vibrant color, and high clarity. Though commonly thought of as a colorless diamond simulant, this tetragonal mineral occurs in several countries in a wide variety of colors. Zircon has been described as having unusual tenebrescent properties (McClure, 2011) and as changing color when irradiated (McClure et al., 2001). 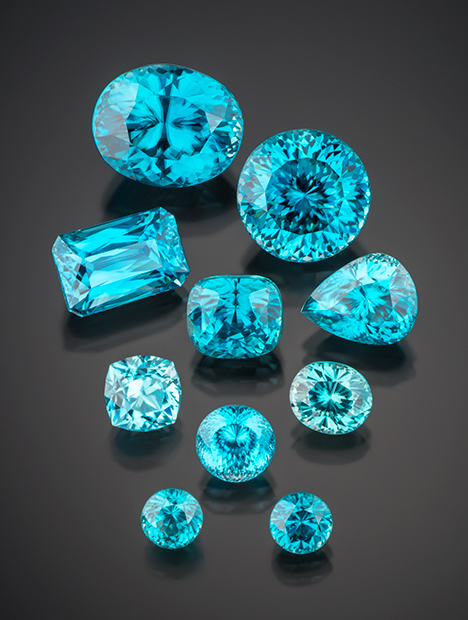 Blue zircon (figure 1) is produced by heat treating brown material to 900–1000°C in a reducing atmosphere (Smith and Balmer, 2009); within the gem trade, all blue zircon is presumed to be heat treated. In recent years, at least two anonymous gem dealers attending the Tucson gem shows have reported to the author that customers returned blue zircons because they had changed to an unattractive brown color (Renfro, 2013). Further inquiry revealed that the zircons had been inadvertently exposed to long-wave ultraviolet (LWUV) radiation, either in a tanning bed or under a UV lamp that cures the epoxy resin used to apply acrylic fingernails. The gem dealers’ main concern was returning the stones to their vivid blue color. One of these stones was reportedly restored to the desired blue, while the status of the other is unknown. Figure 1. Blue zircon, a popular gemstone due to its vibrant color, results from the heat treatment of brown material that contains traces of uranium (Rossman, 1981). Photo by Robert Weldon/GIA, courtesy of Artinian Gems. In the case of a blue zircon that turned brown (Koivula and Misiorowski, 1986), the blue color was restored by placing the stone near an incandescent light bulb for a couple of hours. The more recent reports from the gem dealers prompted the current investigation, in which blue zircons presumed to be heat treated were exposed to LWUV radiation to induce a brown color. The color change was observed and quantitatively measured to determine whether the color could be completely restored. Eleven faceted blue zircons (figure 2) of unknown geographic origin, presumed to be heat-treated material, were studied for color observation before and after exposure to LWUV radiation. A 350 mW, 365 nm LED light source (a GIA prototype that only emits LWUV light) was used at a distance of approximately 1 cm for varying durations. In addition to the 11 faceted stones, one optically oriented wafer (Thomas, 2009) of blue zircon from Cambodia (figure 3) was used for quantitative spectroscopic examination to determine the nature of the color-modifying defect introduced by LWUV exposure. Using an aluminum sample holder with a 3 mm aperture, the author measured the visible spectrum of the oriented wafer at regular 30-second intervals of LWUV exposure using a Perkin Elmer Lambda 950 scanning spectrophotometer with a data interval of 1 nm. Baseline correction for reflection loss was performed on the blue zircon wafer’s spectra by measuring a thin oriented wafer of colorless zircon and subtracting the reflection loss of the colorless sample from the blue zircon spectra. Figure 2. These 11 faceted zircons of unknown origin (left), weighing between 0.62 and 1.96 ct, all showed a brown face-up color after several minutes of LWUV radiation exposure (right). Photos by C.D. Mengason. Figure 3. This 6.67 × 10.56 × 5.17 mm optically oriented wafer of blue zircon was used for spectroscopic examination of the LWUV-induced brown color, seen here using plane-polarized light. The photos show the ordinary (o) ray on the left and the extraordinary (e) ray on the right. The photos on the top were taken prior to LWUV exposure. The 3 mm circular brown spot in the bottom images is the localized area that was exposed to LWUV while the immediate area around the spot was masked by an aluminum sample plate. Here it is unmasked to illustrate the color before and after five minutes of LWUV color modification. Differential spectra were used to determine the nature of the LWUV-induced defect by subtracting the original absorption spectra from the spectra measured after maximum LWUV exposure. CIE L*a*b* color space coordinates were calculated from the baseline-corrected spectra to produce an accurate swatch representative of the color produced by the chromophores in the zircon in both the ordinary (o) and extraordinary (e) rays at LWUV exposure intervals of 30 seconds. The brown color was removed by exposing the samples to an approximately 22 W incandescent light source at a distance of approximately 1 cm. Exposure to LWUV Radiation. Blue color in zircon is attributed to a broad absorption band in the o-ray centered at approximately 650 nm, which is caused by U4+ replacing Zr4+ atoms in the crystal lattice (http://minerals.gps.caltech.edu/FILES/Visible/zircon/Index.html). The e-ray in blue zircon is colorless, and the o-ray is blue (again, see figure 3). LWUV radiation exposure measured at regular 30-second intervals revealed near-complete saturation of the defect in both the o- and e- rays after just over five minutes (figure 4). 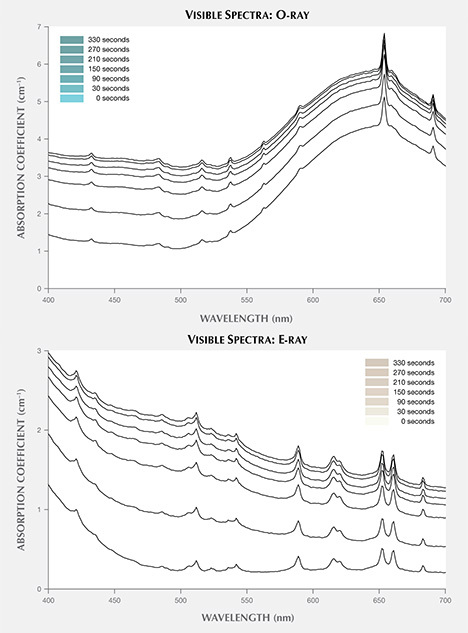 The differential spectra of the ordinary and extraordinary rays, calculated by subtracting the spectra measured before LWUV exposure from the spectra measured after 330 seconds of LWUV exposure, revealed broad absorption bands that imparted a brown component in both rays (figure 5). This explains the overall murky brown color observed in the faceted stones viewed face-up, where the o- and e-rays are mixed (again, see figure 2, right). After 330 seconds of exposure, there was effectively no change in the absorption measured, indicating complete saturation of the brown LWUV-induced defect. Figure 4. 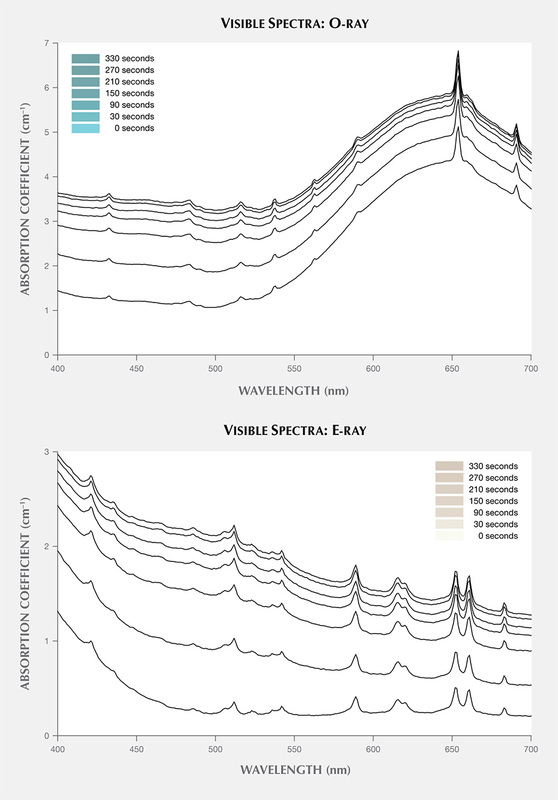 The polarized visible spectra of the blue zircon wafer were measured following 30-second LWUV exposure intervals up to 330 seconds, when a brown color was fully induced. 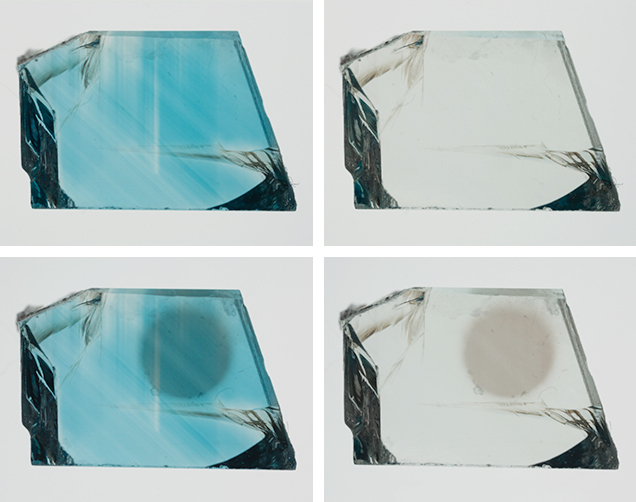 The color swatches were calculated from the collected spectra to show the progressive change in color over time in the o- (top) and e-(bottom) rays of the zircon sample. The spectra were measured at 30-second intervals, but here half of the traces are removed for clarity. Figure 5. Differential spectroscopy was used to determine the absorption contribution of the LWUV-induced defect at maximum saturation. The author subtracted the original visible spectrum from the one measured after 330 seconds of LWUV exposure. The defect responsible for the brown color is primarily characterized by a broadband absorption centered at approximately 485 nm. The color swatches to the right of the plot lines were produced from the differential spectrum in each polarization to show the color contribution from the change in absorption spectra of the LWUV-induced defect alone. Removing the LWUV-Induced Defect. To determine how long it should take to restore this sample’s blue color using an incandescent light source, the blue zircon's visible spectrum was measured three times: in the initial state (red trace), after LWUV exposure (blue trace), and after incandescent light exposure (black trace) at a distance of 1 cm. The absorbance observed at 485 nm was then measured at regular 10-minute intervals until there was no further change in the absorbance. 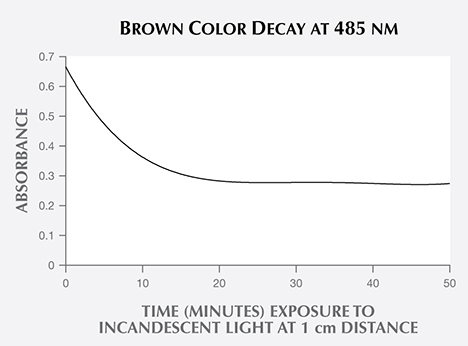 The data collected showed the decay of the brown color (figure 6), indicating complete reversal after approximately 20 minutes. Figure 6. After saturation with the LWUV-induced brown defect, the sample was exposed to an approximately 22 W incandescent bulb at a distance of 1 cm. 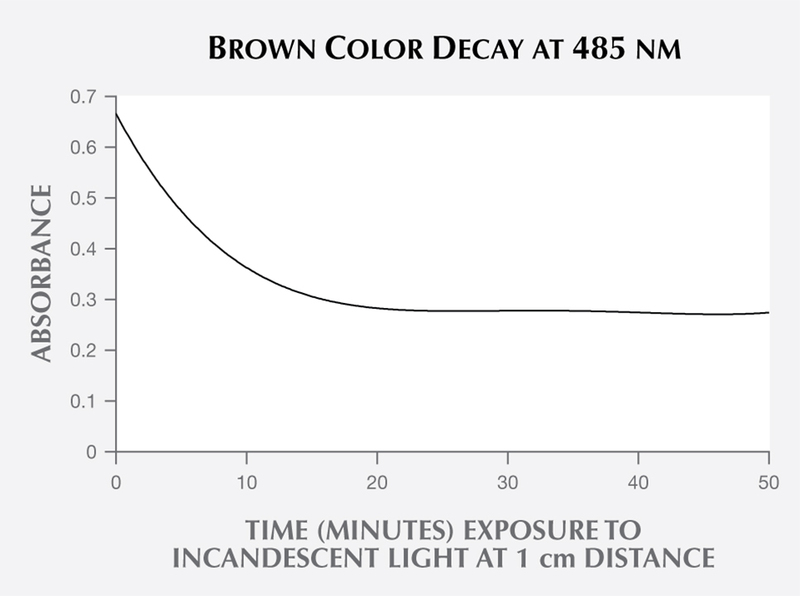 Plotting the absorption measured at 485 nm over 10-minute intervals shows a rapid initial decrease in absorbance and near-complete removal of the LWUV-induced brown color in just over 20 minutes. 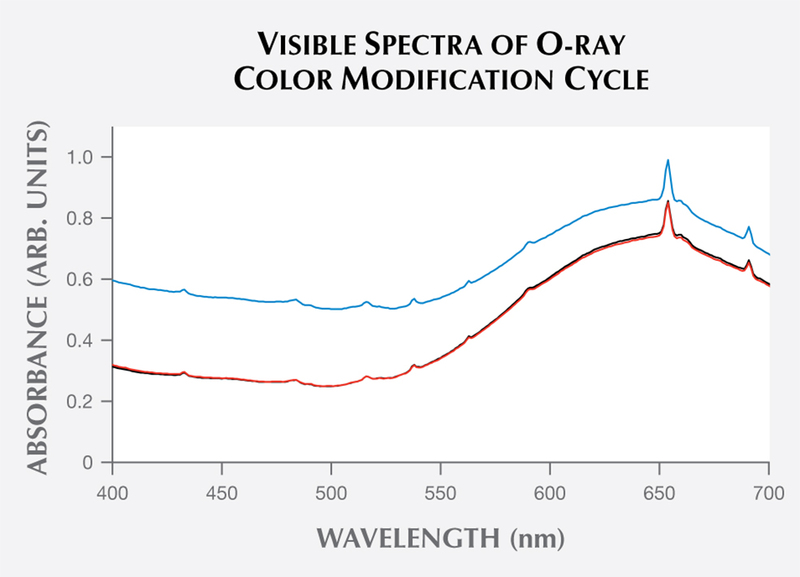 To confirm that the brown color could be completely removed, the visible spectrum taken before LWUV exposure was compared to the spectrum taken after the color reversal by incandescent light. 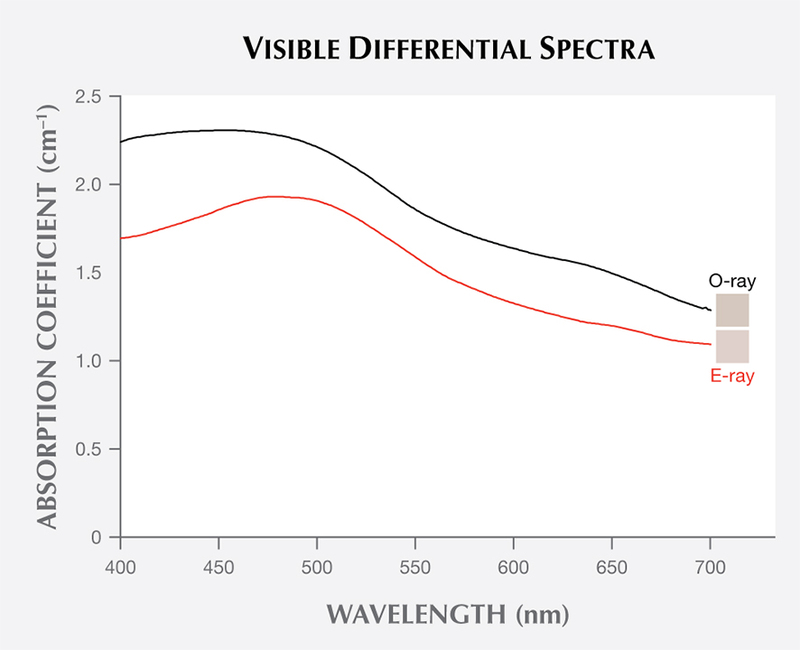 The two spectra were identical, proof that incandescent illumination can restore the material to its original state (figure 7). When the sample was left in a dark environment for one week after LWUV exposure, the brown color remained until the sample was once again exposed to the 22 W incandescent lamp. The sample was also placed near an incandescent light source, with all visible light blocked to see if the low-temperature radiant heat from the lamp would remove the brown color without interference from the light. Over one hour later, the brown color was still present in the sample. After the sample was returned to its blue state, it was also subjected to one minute of short-wave UV using a DiamondView instrument; no perceptible change in color occurred. Similar testing conducted on the 11 faceted stones yielded the same color change and reversal. Figure 7. These three visible spectra of the o-ray show the blue zircon sample at its initial state (red trace), after LWUV exposure (blue trace), and after one hour of exposure to incandescent light (black trace). Because the initial and final traces essentially overlay each other, we know the blue color has been completely restored and the induced brown color has been removed. Blue zircon (figure 8) displays an interesting reversible color modification, with long-wave UV exposure turning the material brown in less than six minutes. In this study, the blue color was completely restored to all samples by exposing the stone to an incandescent source for about 20 minutes. Dealers should caution clients who purchase blue zircon to avoid LWUV sources. If such exposure does occur, they can inform their clients that the color change appears to be easily and completely reversible through the use of incandescent lighting. Figure 8. 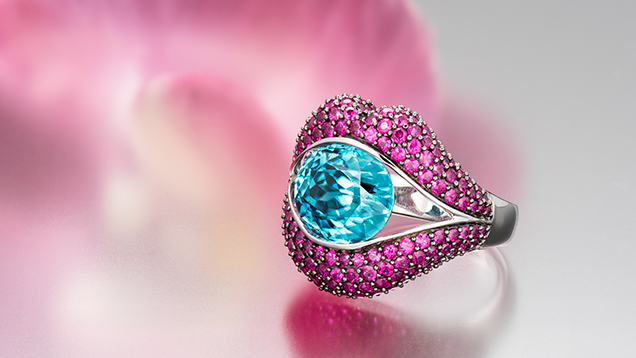 Brilliant and doubly refractive, blue zircon is a favorite among jewelry buyers. This 7.95 ct blue zircon ring designed by Loretta Castoro, also shown on the cover, is set in 18K white gold and contains 2.43 carats of rubies. Photo by Kevin Schumacher. Mr. Renfro is the analytical manager of the gem identification department, and microscopist of the inclusion research department, at GIA in Carlsbad, California. The author would like to thank the three anonymous peer reviewers of the manuscript for their constructive feedback. Koivula J.I., Misiorowski E., Eds. (1986) Gem News: Undesirable color change in blue zircon. G&G, Vol. 22, No. 2, pp. 188–189. McClure S.F. (2011) Lab Notes: Tenebrescent zircon. G&G, Vol. 47, No. 4, pp. 314–315. McClure S.F., Moses T.M., Koivula J.I. (2001) Gem News International: U.S. Postal Service irradiation process may affect some gemstones. G&G, Vol. 37, No. 4, pp. 326–328. Renfro N.D. (2013) Reversible color modification of blue zircon by long wave ultraviolet radiation. GSA Abstracts with Programs, Vol. 45, No. 7, Abstract No. 226600. Smith M., Balmer W. (2009) Gem News International: Zircon mining in Cambodia. G&G, Vol. 45, No. 2, pp. 152–154. Explore zircon history, research, quality factors, and more in the GIA Gem Encyclopedia. Advances in technology and increased demand for lower-priced gem materials contributed to the proliferation of new treatments throughout the first decade of the 2000s. A discussion of work being done to enhance color in gemstones, as well as some techniques used at the California Institute of Technology to detect whether colors are natural or lab-enhanced.